The “Dialogical Model” for reading contemporary art has many antecedents. It can be found in the thought and writings of Plato who, in 5th B.C.E. Athens, described the centrality of the dialogical form as “Socratic dialogue,” employed as an educational tool by his teacher Socrates. Centuries later, Martin Buber’s canonical book I and Thou (1923), enormously influenced pedagogical worth of dialogue, and Carl Rogers in his best known contribution to humanistic psychology and the facilitation of learning, speaks of congruence, acceptance and empathy — three main tenets for dialogue. Jurgen Habermas’s Theory of communicative action (1984) is important to our discussion, with its well-known distinction between “power claims” as opposed to “validity claims,” that are the basis of dialogic learning. While in “power claims” the argument of force is applied, in “validity claims” the force of an argument prevails. We should not impose our arguments by means of force, but by being ready to enter into a dialogue in which other people’s arguments may lead us to alter our initial positions. Another meaningful point of view is Mikael Bakhtin’s (1981) who, in his The dialogic imagination states that “individual speech” cannot be separated from “collective speech,” and that whenever we express our individual views on a specific issue, we cannot separate them from those of others. Our personal ways of giving meaning reflect dialogues that we have had with others, and reveal meanings that we have created in previous dialogues with others. In the field of Museum Education the dialogue, as it is conceived by Rika Burnham and Elliotte Kai-Kee (2011), is one of three modes of engaging in a collective-talk in front of a work of art in an art gallery: conversation, discussion and dialogue (Teaching in the art museum: Interpretation as experience, pp. 79-93). Conversation, they propose, is the most loosely structured of these modes of talk. It occurs constantly whenever teachers and visitors join to face a work of art in museum galleries; they enter a world of creative speculation and together construct “a conversation.” Conversation seeks equilibrium and furthers inclusiveness. The teacher’s role during a conversation is mainly to promote a sufficiently constructive atmosphere in which every participant is comfortable expressing his or her views. During a “discussion” the role of the teacher changes. The discussion derives from a classroom practice that seeks to promote critical and creative thinking and problem solving skills. The instructor’s responsibility is to raise a subject according to his or her educational goals and, through questions, to lead the discussion. “Dialogue” is defined mainly by being located in that middle space between conversation and discussion, as is very clearly defined by its “four-sided model”: the mover, the follower, the bystander and the opposer[MOU2] . Participants in the dialogue are free to choose a role and to change that role during the session. Dialogue shares the open improvisatory quality of conversation but it is imbued from the outset with a stronger sense of purpose and is more tightly focused on artworks (p. 86). Professionals working with Visual Thinking Strategies (VTS) have their own model for talking with both children and adults in front of works of art. Through the constant question “What do you see?” they move the participants towards using their thinking and speaking faculties. Philip Yenawine (2013) describes a goal of “improving class participation and students’ engagement while deepening the thinking, language ability, writing skills, and visual literacy of their students.” Although the word “dialogue” is not frequently employed in VTS writing, VTS teachers actually perform dialogue or engage in it. Their goals, however, are directed not only towards the deeper understanding and interpreting of the work of art, but at providing their students (especially those who hang back), with the skills to level the field: to introduce language skills as a vehicle for collective meaning-making that extends across disciplines, and to establish a clear means of raising students’ abilities through peer learning. The model which I named “The Dialogical Model for Reading Contemporary Art,” was developed through many years of working with children and adults in art galleries in the Tel Aviv Museum of Art, by watching museum teachers engaging in this process, and by teaching art students how to talk with children about art in my “Museum Education” course at the Art and Education Faculty, Beit-Berl College, Israel. The photos above depict how a dialogical talk with children looks. It is informal in nature and the adult who leads the talk sits among the children. They are invited to look at a work of art (usually of their own choice) as well as to relate to their friends in an animated discussion among themselves. The dialogic process was created mainly for encounters between a broad public: a non-professional public of adults as well as children, and contemporary art. “Broad public” describes persons who are not necessarily professionals such as arts students, arts teachers, artists, museum and gallery professionals, art dealers, art critics, etc. “Contemporary art works” refers to works created by artists in the current time, art works that adults as well as children can read well enough without being provided with (at the beginning of the process) additional contextual information. This assumption is based on the work of Bosch (1998) who states “contemporary art is for contemporary people” (p. 150). Bosch is speaking out against an often endorsed agreement that meeting with contemporary art is more difficult than encounters with art of earlier periods. “Children are necessarily contemporary. They cannot be otherwise. Their absolute lack of knowledge about the world, which for an adult would be disastrous, is an unmistakable sign of the future pushing them forward. Children’s contemporary gaze is then the ideal complement for the historical sense grown-ups acquire” (p. 150). The assumption of the dialogical process, at its first stage is that children and adults can take the first steps in reading contemporary art relying solely on their own knowledge and experiences of the world without any supplementary information, just by looking, thinking and talking. Outside knowledge may come later in the process, but not before direct looking and thinking. What is important at the beginning of the Dialogical Process is to look, to experience and then to talk. The first moment that one views an artwork functions on a double axis, framed by an “it” and “me” experience that links the work and its artist with the viewer: what the viewers see, experience, think, understand, feel, and remember/recall, and what interested, aroused curiosity, moved, and was important to the artist. Other worthy methods have been proposed to encourage an encounter between the public and works of art. One of these is described by Burnham and Kai-Kee (2011) as they define different modes of a verbal encounter that includes conversation, discussion and dialogue. Their main concern is the quality and dynamics of the dialogic situation, the different options and the role of the teacher in developing the process. In using the VTS method (Yenawine, 2013), the teacher asks of his or her child audience, “What do you see?” VTS is committed to developing conversation skills and is concerned with using artworks to promote children’s verbal expression as a strategy for thinking that can deepen learning across different school disciplines. The model of the dialogic process presented in this paper emphasizes yet a different perspective. Its main interest is to reach the “aboutness” of the work of art through a dialogical process based on several stages. It suggests that an artwork does not have a message, rather it has an “aboutness.” This term is borrowed from Barrett (2000) and is expanded upon with the dialogical model presented. Through aboutness, the artist invites us, proposes to us, asks us to enter into something that is or might be interesting, challenging, moving, stunning (a “wow” moment), meaningful, troubling, intriguing or stimulating. This is the aboutness of the artwork. Aboutness can be about the world, the life of the artist, and or the life of art itself. A work of art can have numerous aboutness-es, and very often a good work of art will probably have more than one. Aboutness is not a message. An example of the difference between aboutness and a message is in Picasso’s Guernica(1937). The artist sets before us a private story without words. The story asks us to look at how one act of war destroys what existed only moments before in a now previous life. If one wishes to look for a message, such as an anti-war message, this is of course possible and one will have to create it as a construct or a narrative expressed in words. An example of an important aboutness of Picasso’s Guernica (1937) is the explosive moment of a bomb attack on a peaceable community: people, structures and animals, a world now turned upside down. Of course there might be more than one aboutness in this artwork, and this depends on the different components of the art work that were previously defined. If one is looking to find “a message” it will have to come after the image. The dialogical process works towards a rich and thick description of the aboutness of an artwork. This sum of the different aboutness is what is called “interpretation.” However, one does not stop at mere description of the artwork and the reactions of the viewers, but pushes forward to the interpretation of the work’s aboutness in the dialogical model. The method of the dialogical process is based on conversation, using open-ended questions and establishing a non-judgmental, supportive environment for self-expression, cooperation between participants, and above all, the presence of the animator or facilitator as one not in possession of all the answers. The process begins by looking at the work of art itself. Information and contextualization about the artwork is provided only after an in-depth reading of the work itself has been exhausted, and, no less important, according to the demand of the participants. The dialogical process works towards a rich and thick description of the aboutness of the artwork. The goal is to reach for as much as possible of its aboutness. It is important to emphasize that each group of spectators will develop its own special list of aboutness-es, and groups may differ enormously in their interpretation of the same work of art according to their different personalities, private associations, opinions and views. In the case study that follows, a photograph of an artwork created by Israeli artist, Lezli Kunda-Rubin was used. The work was created on the branches of an olive tree in the back garden of her home in a small town near Tel Aviv, 2001-2005. Although background information is known to the animator[MOU4] , he or she may decide not to share it with the participants on this first encounter, and to let them “read” with no context whatsoever. The first question directed to the participants was, “Here is a work of art. What is your reaction to what you see?” Note that the question does not request that the members of the group describe what they see. The dialogic model asks for a “first reaction” before the process of describing the artwork. Children generally respond to this freely. Adults often have much greater difficulty. The aim is to legitimize first responses and to be able to foreground to and with the group the broad range of responses that can arise; be they emotional, associative, memory, judgmental, intellectual, a story. All of these different reactions characterize first encounters with an artwork and it is important to let them be heard by all group participants. At this stage the groundwork for the upcoming conversation is set. The animator legitimizes all reactions towards artworks and the participants are called upon to share their opinions, emotions and memories. By this point it becomes clear to the participants that their responses can be wide ranging and might be very personal. This realization is meaningful for participants and allows them to enter into an involvement with the dialogical process. Only after this stage is complete, does the group move on to the description of the artwork itself. The second question was, “What do you see?” In this process as participants describe what they see, developing verbal and observational skills, however, the main goal is to arrive at a list of the essential components that make up the artwork. These components are the building blocks needed for an interpretation. The different aboutness-es of the interpretation must contain and relate to these components. The more components an interpretation takes into consideration, the stronger and more solid it is. 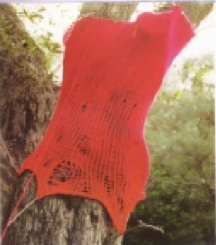 Some participants found that holes in the knitting might represent violence, wear and tear, or being worn out. The cut branch might represent renewal of the growth of the tree, and at the same time a sign of violence or even amputation of a limb or mutilation. It is important to emphasize that the representations shared may often conflict with one another. This leads to richer interpretations and it is encouraged during the entire process. Some students saw violence against women and the red sweater as evidence for a crime being held in the forest. Knowing the political situation in Israel, some students thought that this artwork is about violence relating to the uprooting of ancient olive trees, a part of the Israeli-Palestinian conflict. Of course there is no single exhaustive interpretation of any artwork. The next question in the process is, “Do you find this artwork interesting, satisfying, challenging and meaningful?” At this stage some of the viewers might say that they have changed their views about the artwork as a result of the dialogue, due to the fact that they had enough time to look at it and hear others relating to it. In effect, they could now reexamine their own views. The final questions are always the same, “Are you interested in knowing more about the artist? Are you interested in seeing more works by this artist or by other artists who might be engaging with similar issues?” During this stage of the process, more information is provided about the artist and more works by her or him can be shared. It is in this stage where a wider background and context to the unique work of art or professional terminology is supplied if needed. This could include viewing the artwork from a wider angle and historical perspective. In conclusion, the impact of the dialogic model can be summed up through Barrett’s (2000) insights about interpretation as he claims that interpretation can be judged by its coherence, correspondence and inclusiveness, and that the artwork is not necessarily about what the artist wanted it to be and that its meaning should not be limited to the artist’s intent. Interpretation is ultimately a communal endeavor, and the community is ultimately self-corrective. Finally, above all, good interpretations invite us to see for ourselves, and to continue to encourage meaning-making of our own. Aloni, N. ed. (2008). Empowering dialogues in humanistic education. Tel Aviv: Hakibbutz Hameuchad Pulishing House (Hebrew). Armstrong, J. (2000). Move closer: An intimate philosophy of art. New York: Farrar, Straus and Giroux. Barrett, T. (1994). Criticizing art: Understanding the contemporary. London & Toronto: Mayfield Publishing Company. Barrett, T. (2000). 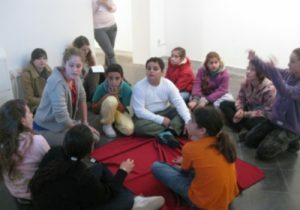 About art interpretation for art education. Studies in Art Education, 42(1), 5-19. Bosch, E. (1998). The pleasure of beholding: The visitor’s museum. Barcelona: ACTAR. Burnham R. & Kai-Kee, E. (2011). 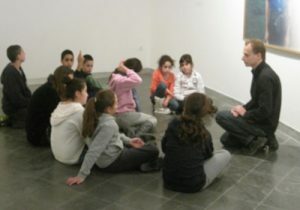 Teaching in the art museum: Interpretation as experience. Los Angeles: The J. Paul Getty Museum. Funch, B. S. (1997). The psychology of art appreciation. Copenhagen: Museum Tusculanum Press. Freire, P. (1970). Pedagogy of the Oppressed. New York: Continuum Books. Habermas, J. (1984). The theory of communicative action. Volume I: Reason and the rationalization of society, and Volume II: Lifeworld and system: A critique of functionalist reason. Boston: Beacon Press (O.V. 1981). Shalita, R. (2013). Dialogue with contemporary art. Tel Aviv: Mofet Institute (Hebrew). Yenawine, P. (2013). Visual thinking strategies: Using art to deepen learning across school disciplines. Cambridge MA: Harvard Education Press.